Does your child throw tantrums? Kick, scream, hit, pinch, push and punch? Are you struggling to manage your child’s behaviour? Unsure how to discipline appropriately? Differences between mom and dad’s views? In our world it is very important for our children to develop socially and to form friendships. To do this children need to develop social skills: being able to listen to others, to share, care, and learn to communicate in a positive manner. Their behaviour toolbox will need to include: manners, respect, and the ability to learn self control. This workshop will provide parents with a toolkit that will shape their child’s behaviour in a constructive way – without crushing their spirit. Booking is essential and can be done by phoning Lynette at 0837933320 after hours. a wealth of parenting tools to assist you in your role as educator. Lynette is an Evergreen Parenting facilitator and is currently running both an Afrikaans and English Evergreen Parenting course. She also has the Evergreen products for sale. 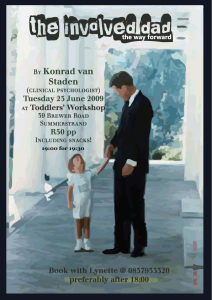 Description: Konrad van Staden (Clinical Psychologist) Tuesday 23 June 19:00 for 19:30/ R50 per person. Snacks included. See article for more details. We live in a world where parenting is receiving so much focus. It seems to be the topic of many talk shows and magazine articles. We even have entire magazines focused solely on parenting. But most of the issues of parenting are focused on the mother-child relationship with little emphasis on the role of the father. Our society puts so little worth on the role of the father, sometimes seeming blind at the expense our children are suffering for absent fathers. The consequence of absent and non-involved fathers carries weighted consequences. A child born to a family where the father is absent is more likely to be exposed to neglect, physical illness, emotional neglect and abuse. Fathers who are more involved with their children are conversely more likely to be non-violent towards their children and partner. 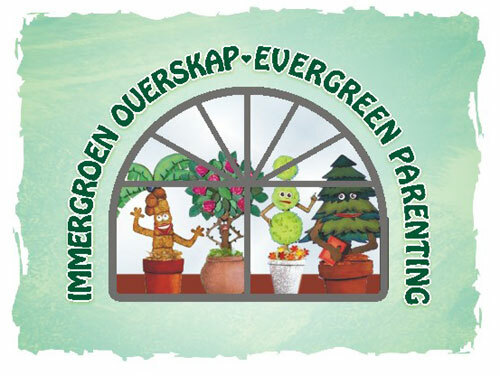 Andalene Salvesen, co-presenter of Evergreen Parenting and founder of Monster to Munchkins (the South African super granny), will be in PE on Wednesday 13 May to answer the most common questions parents normally ask. Andalene is an amazing speaker and has a beautiful sense of humour. 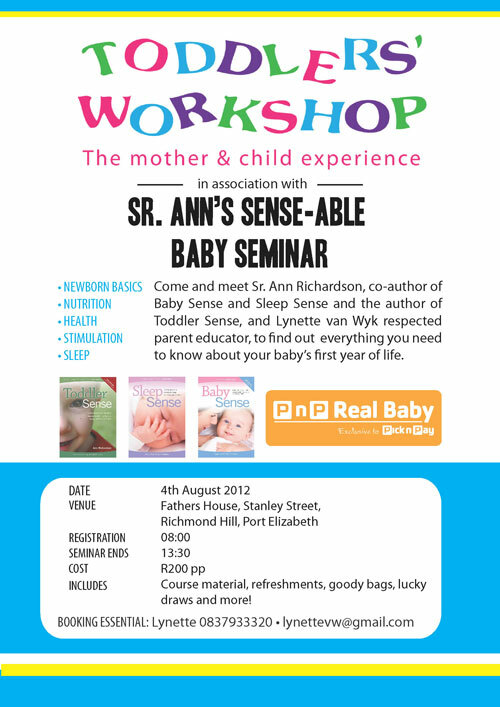 Be sure to book for this event through Lynette van Wyk on 0837933320, preferably after 20:00. The event will take place at the Dutch Reformed Church in 77 Louis Botha Crescent, Summerstrand and will run from 18:30 until 20:00. The cost for the evening will be R50 and only 80 people can be accommodated. Book NOW for this most worthwhile event. 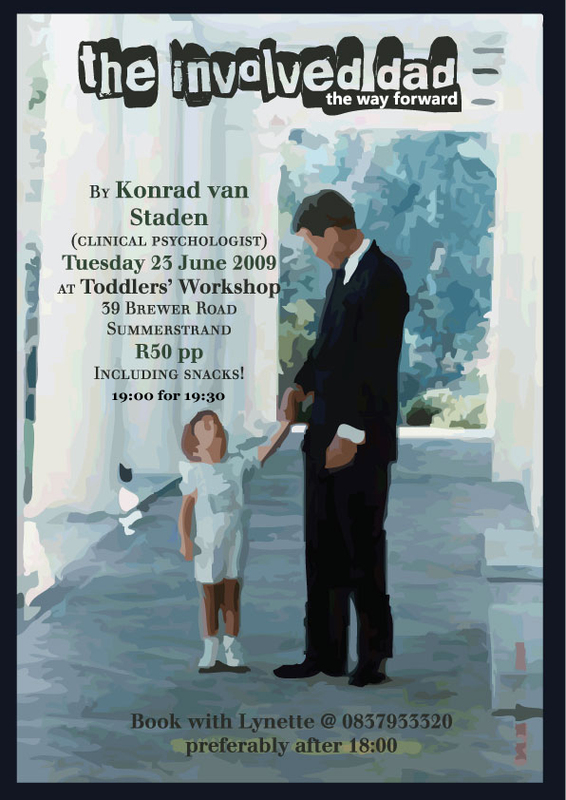 For more info about Evergreen Parenting visit the website www.evergreenparenting.co.za. For more info about Monsters to Munchkins visit www.monsterstomunchkins.co.za.